Yesterday a federal judge slapped down AT&T's (rather whiny) restraining order against Verizon over the now infamous "There's a Map for That" advertisements. 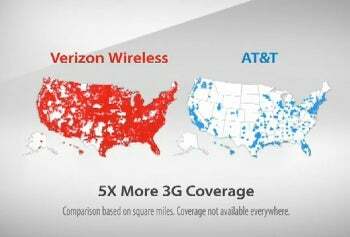 The ads show a U.S. map comparing AT&T's 3G coverage to Verizon's more impressive reach. AT&T did not deny its 3G coverage was pathetic but rather stressed that customers can still get cell reception and use the mobile Internet via its 2G EDGE network. To that, Verizon released a snarky legal filing that essentially said "the truth hurts." Don't expect AT&T to pack up its bags after this latest setback. Mark Siegel, a spokesman for AT&T, told CNET in an e-mail: "While we are disappointed with the court's decision on our request for a temporary restraining order, we still feel strongly that Verizon's ads mislead consumers into thinking that AT&T doesn't offer wireless service in large portions of the country, which is clearly not the case. We look forward to presenting our case to the court in the near future." Persistence in this case may not be the best route for AT&T. AT&T's brand image has already suffered at the hands of Verizon, while Verizon's public persona has been gleaming since the start of its aggressive ad campaign. If AT&T continues to whine, and therefore expose more and more people to Verizon's ads, the company could come off swaddled in diapers and headed to bed early. If it cannot defeat Verizon in the court or in the court of public opinion, perhaps it's time AT&T took the high road, quit, and stopped the teary-eyed back-and-forth. It should focus on bolstering its 3G network and preparing for the onslaught of 4G, instead of dwelling in past missteps and slights.